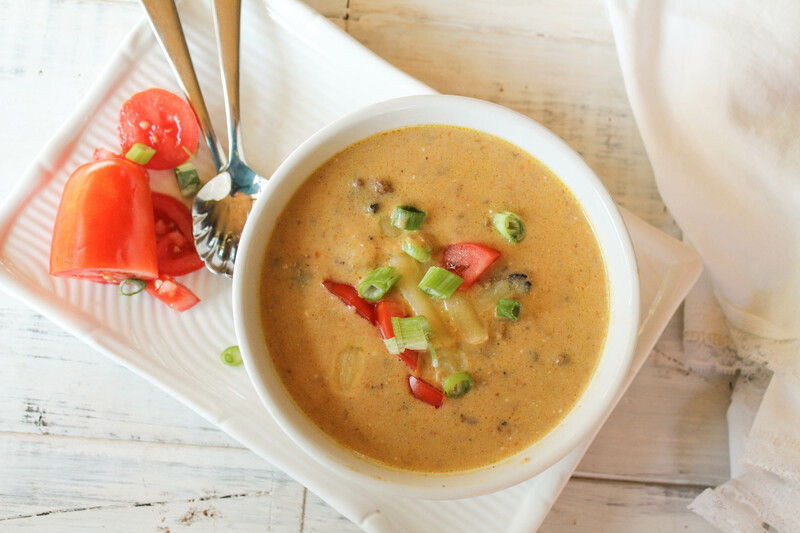 Warming, flavorful, and loaded with tons of hidden vegetables, this low carb, keto friendly Instant Pot cheeseburger soup is an awesome one pot dinner!! The smell of bacon will fill your house as you prep this filling and creamy soup. 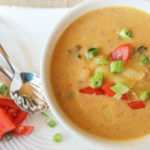 Summer may be over, but the flavors of a good bacon cheeseburger are still a winning combination, so why not as an Instant Pot bacon cheeseburger soup? With the change of seasons and moving into cooler weather my internal musings instantly turn to all varieties of warming foods: therefore things like pumpkin, squash, and soups are my heavy hitters! The beauty of this low carb Instant Pot bacon cheeseburger soup is that it is so darn versatile and easily adaptable to so many diets and preferences. In this recipe, I was going for family friendly (read between the lines: picky kids will actually eat it), nutritious, and quick. Probably the latter being THE most important to me. Enter the Instant Pot. While this soup could easily be made on the stove…I know my peeps are hungry for even more ways to use their beloved electric pressure cooker! As a result, I am busy experimenting on my end all the time! Why The Instant Pot At All?! What’s the craze? The Instant Pot has garnered a cult following most of all because it saves busy moms TIME, and it is EASY! But it also keeps the stove clean…which in my world gets high points!! Like SUPER high points…who’s with me??!! And it locks in flavor and keeps foods moist and delicious. Yeah. That too. If you are on the fence, consider taking the plunge. Since most moms I know LOVE to save time, you get a meal on the table in a flash! Another bonus is the whole set and forget feature…it is truly brilliant! In my family, I puree all the vegetables in the soup . This improves my chances of my kids eating a food containing vegetables….MIXED with other foods, oh the horror!!!. But if you do not care, OR you simply like your soups chunky, you can forgo this step!! Either way, grab a bowl and get cozy! You could also check out my Gluten Free | Paleo Instant Pot Board on Pinterest! I add new recipes from all over the web weekly! Be sure to follow me as I curate all sorts of nutritious and delicious recipes for families! Continue with the ground beef. Brown the meat until cooked through, remove. Lock on the lid, set manual for 7 minutes. Now, using an immersion blender, right in the pot, puree the vegetables. Stir in the cheeses, blend again to mix. Stir the bacon and hamburger back in, let sit for a few minutes to warm gently back up. What’s not to love about something called Cheeseburger soup!? Sounds so good. Thanks for sharing! Hi! I know this recipe makes 6 servings but can you please tell me what measurement one serving is? I need to calculate the carbs precisely for my husband who is a diabetic. Thank you. I’m sorry, I’ve never measured it out that way. At least not exact enough for your needs. It’s approximately six to cup i’m sorry, I’ve never measured it out that way. At least not exact enough for your needs. It’s approximately six two cup bowls. Made this for dinner last night following the recipe to a T. It was delicious!! Everyone liked it and asked when I would make it again. The soup on its own was really tasty, however we added some diced pickles, red onion, and tomatoes as a garnish. Soooooo good! Awesome Brian, excellent additions to complete that hamburger experience! We just made this Friday too!! I do not have an immersion blender 😭 what can I do? Get one if the budget allows! You can get one for under 20 I believe! They’re amazing and quite handy! LOL Sharon!! Such great additions!! So glad you enjoyed it!! Absolutely love this idea, perfect comfort food! And it doesn’t hurt there’s all those puréed veggies added in too! This sounds delicious – I like the idea of a cheeseburger and soup all in one. This would be a huge win with my family bc it has all of their favorite goodies… cheeseburgers and bacon. I am trying this out on them and hope that it becomes a weekly favorite. So yummy and easy to make in the IP! My mom made a cheeseburger chowder when I was a little girl that I loved – but hers didn’t have bacon in it. Your version is awesome! Yep… bacon on a cheeseburger (and in a soup!) is the only way. Plus, duh on the IP. I don’t know how we lived without them! I love my Instant Pot! This soup looks delicious. I know my kids will love it. Dannnng! Look how delicious and creamy this looks! I can’t wait to try! Love the extra cheesy flavor to this hearty dish. My husband loves burgers so I’m sure he’ll enjoy this recipe very much! O wow, I’m drooling just from the name of this soup! Sounds like the ultimate comfort food. Oh MY! My kids would completely go nuts over this soup! Great idea! Thank you! Bacon cheeseburger soup?!? Heck yeah. You are speaking my language over here. YUM!! Cheeseburger soup! I am excited. I have never had it but now I will! My family loves this! Easy, delicious and nutritious! Thanks! Thanks Zsofia…glad it is enjoyed!! I would love to know what kind of cream cheese and cheddar cheese you recommend! Thanks so much! Nancy’s is a great cultured cream cheese brand, I also use Whole Foods brand, the organic one. There are so many great cheeses out there! I love all the cheddars made by Kerrygold. In a pinch, I use Tillamook brand, the sharp white cheddar variety! I made this for dinner tonight and all of us LOVED it!!! Thanks for another great recipe, 2 thumbs up for sure!!!! Awesome Cassidy, glad it was hit!! i can;t wait for it not to be 90 and 100 degrees so I crave soups again! To save more time, I skip all the dicing of the vegetables. It gets puréed anyways! And to those who don’t think their family will eat even puréed cauliflower, trust me, you cannot taste it! Amen sister!! My kids are none the wiser too!! Is there anything that can be substituted for the cauliflower? No way will the fam eat that , blended or not. I love it, but they do not. Hi Marian, you can leave it out or try some potato if you like. Otherwise, if you want it thicker, and a slurry of 1 tablespoon starch.1 tablespoon water to pot to thicken! Do you happen to have the nutritional value for this dish? Is the 22g carbs a typo?! I calculated 5g (I omitted the carrots). Hi KC! I don’t have the nutritional info listed? But 5g sounds much more likely! I want to try it but I cannot eat cheese because of my intolerance. Any suggestion? Marisa recently posted…Is Cheese Keto? Why Dairy Might Not Be As Healthy As You Think! A couple of ideas I had planned on trying: Adding MORE cauliflower and deceasing broth for thickness. OR adding 1/2 cup ish of raw cashews using 3 cups broth only….but then mixture would need to be blended to cream the broth up with the cashews. If I did this, it *might* be necessary to bump the umami for flavor (bacon and veggies/homemade broth might be enough), so would experiment with a few tablespoons tomato paste, nutritional yeast, or the umami paste at Trader Joes. Does that help Marisa? I am excited to try this recipe. On this rainy day today I was just thinking I need to get more soup recipes going. This one will be on top of the list. Enjoy! It is getting rave reviews from my friends! you got to try it!! Great!! Glad your family enjoys it Leann! It’s pretty rockin Michelle, do you have an Instant pot yet? Or will you do a stove top version? We made this tonight! So good and NO leftovers. The best part, they couldn’t see the vegetables! yes…no see…no complain!! Glad you guys enjoyed it!